For 25 years, local photographer Emily Matyas captured the Mexican spirit and heritage on film while living in Sonora, Mexico. 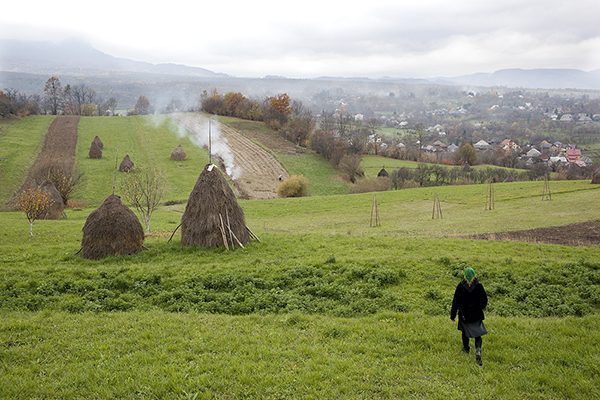 In October, she decided it was time to catalogue her own heritage, a journey that would take her to the distant peasant villages of Romania. For Tempe photographer Emily Matyas, her deceased father’s Romanian heritage was always a mystery, a missing piece in the puzzle of her sense of self. In Oct. 2013, she decided it was time to fill in the blanks. With friend and fellow photographer Kathleen Laraia McLaughlin, an adjunct professor at Loyola Marymount University in Los Angeles, Emily made her way to the Romanian village of Sarbi, where she would spend 10 days taking self-portraits as she lived the life of her peasant ancestors — wearing the traditional garb, helping with the exhausting chores, and interacting with the locals. Though Emily admits she often felt like a fish out of water living in a village of outhouses, haystacks and ancient customs, she said the trip helped her understand her identity more fully. People will have the chance to view Emily’s photographs, along with seven other up-and-coming photographers, during “Home Bound,” an art exhibition Jan. 17 to Feb. 28 at Gilbert’s Art Intersection (207 North Gilbert Road, Suite 201, Gilbert). Other photographers featured will include LA-based artist Kristin Bedford, whose images of the “Father Divine” religious sect were recently featured in the New York Times, and Daniel Coburn, a Kansas-based photographer whose first book “The Hereditary Estate” is due for release April 14.